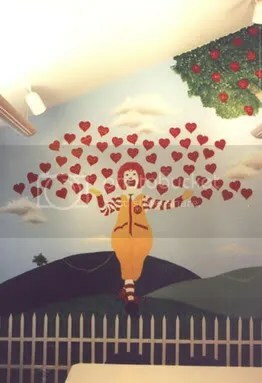 Well, we’re at The Ronald McDonald house now. And are we ever reveling in the abundant space! I never knew a two bedroom apartment could fell so spacious. We have, to date, played countless games of hide and go seek. This is, by the way, a game that Kajsa has yet to grasp the concept of. But, she’s enjoying it anyway. She ALWAYS hides in the middle of the bathroom, and comes running as soon as she hears, "Ready or not, here I come." But it’s a fantastic way to get her active again. A month in a bed undid much of her physical therepy. When we’re out, she only limps a few steps now before she’s tired and needs to be carried. Yep, I’m carrying a toddler everywhere. Gee, could I use a massage right about now. Too bad my massage therapist is off earning a paycheck elsewhere. Speaking of, Chris is down for the day. It’s fantastic to see him! It’s been two weeks, and I missed him so much. I’m hoping that we can get out to a nice park – with water – later in the day. This’ll have to be after the weather cools somewhat. It is so unbelievable hot here. UNBELIEVABLY HOT! Also, I get the stupendous luxury of hitting a grocery store. And you know what I’m not going to buy? Boca Burgers. Dear heavens, am I sick of them. Did you know that I have had a Boca Burger every single night for a month? Being a vegetarian in the hospital is a slow culinary slide into death by boredom. I plan to make many gastronomic delights during our time here. I’m even planning a nice picnic for the fourth, as Chris has that off, too. Ideas, anyone? Oh, did you want to hear about Kajsa’s health? It’s great…relatively speaking. She responded well to the OKT3 and has now left it for oral anti rejection meds, which appear to be working. He creatinine is down to 0.5 again and holding. We have labs drawn three days a week, just to make sure. Our biggest challenge, at the moment, is simply keeping her uber hydrated. As in 2 liters a day hydrated. That big ole kidney simply needs lots of juiciness. Can I get three cheers for the g-tube? I have her drinking lots of water, too. Maybe we can even set up some good habits for the kiddo. What a novel idea. Kajsa can leave the RMH with a mask and tons of sunscreen. We still don’t have a car in Phoenix. But my parents are flying in on the 6th and I plan to do lots of fun stuff with them. It needs to be mostly away from people so we’ll visit the zoo and the desert botanical gardens; stuff like that. I know that our life is still a bit narrow, but just these few new reintroduced options have made life so much happier and relaxed. I am glad that the world is broadening for Kajsa and your family. Glad, too, that you get to spend some time with Chris. Enjoy yourselves and have a happy Fourth. Yuck, to Boca Burgers. I prefer Gardenburgers anyway. I hope you found some nice veggie friendly things to eat! You might want to avoid the zoo, just because everyone will probably be there. I think water sounds great. I am glad Kajsa is doing so well. I hope she is loving the water. I know it is one of my favorite beverages! Wonderful, wonderful news. You all deserve this change! So nice that she is now able to a child again without too much of the fuss. And you can all try to be a family again. Sounds great. Have a fun holiday and enjoy the sunshine. It will do you all some good! Congratulations! I know how life-expanding it can feel to get out of the hospital and begin to make something like your own schedule again. BTW, I hope you got my package? I mailed it to the hospital address, so if you haven’t gotten it, be sure to check over there. What a slow-poke I am. Great to hear how things have improved for Kajsa. I’m so glad to hear that all is going so well!! I knew you’d love the RMH! They are wonderful!! Hooray for your newfound freedom! May you eat deliciously, play wildly, and have the best time you can have with Kajsa. I’m always so happy to read the good news. Thinking about you all the time – and I hope you got my package too? It took forever to get sent out, sorry! But there are cookies which need to be eaten soonish.